This film employs some very imaginative technique. The story of the painter's life is told in flashback by a dying Goya. In his recollections, the stories appear as if in paintings themselves, or as if on stage. For example, we can sometimes see people walking behind walls, as if the walls were a stage scrim. (This allows old Goya to stand and comment on the actions of his younger self). In the battle scenes, we see a minimal number of soldiers in a green spotlight fighting before an orange painted backdrop. In the aftermath of battle, in the snow, we see the orange backdrop become pink, and the green spotlight become deep blue. 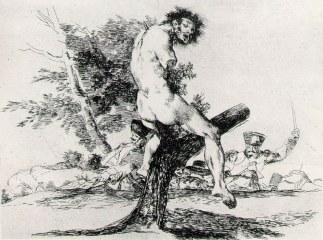 Maribel Verdu is seen completely naked from all directions, first posing for the Naked Maja painting, then as the object of Goya's passion, inflamed by talking to her and painting her naked. Viewed out of context, these scenes look like the Greater Des Plaines High School performance of "Les Miserables", but this sequence is actually a Catalan theater group re-enacting their interpretation of the engravings entitled, "The Disasters of War" (left). Court scenes are bathed in golden ambient light. The opening scene is a surrealist painting, anachronistic by more than a century, but prefigured in some of Goya's own works. One scene in the park looks like an impressionist's dream, with sun-bathed saturated greens and bright reds, this time about a half century before their time. (If I get it correctly, Goya is considered to be a precursor of modernism, so modernist styles are shown as an extension of his mind.) Other scenes look naturalistic. Anyway, the visuals are generally creative portrayals of the inside of an artist's mind - often mimimalistic and symbolic, allowing a few characters to stand in place of many. Goya's imaginings are in many different styles because he employed many different painting styles through his long life, and he had a major shift in the style and theme of his work after a bout with fever that nearly killed him when he was about 40. Kind of a lesson in Spanish art and politics, more suitable to a classroom than a theater. I expected to hear those little ringing noises which remind the teacher to move on to the next image in the film strip. I guess Carlos Saura, the writer/director, was aware of how dull this movie is. As Goya relates his story to his daughter, her attention wanders. General consensus: two stars. Ebert 2/4, Apollo 47. With their votes ... IMDB summary: IMDb voters score it 6.2 (very few votes), Apollo users a pathetic 25/100. A bit under a million U.S. gross, on the art house circuit - about 25 screens. Based on this description, this film is a C-. Excessively precious and pretentious film that will turn off everyone except the art house crowd.